The Soyuz TMA-04M mission originally scheduled for the spring of 2012 had a goal of delivering three members of the International Space Station crew, which represented the 31st and 32nd long-duration expeditions onboard the orbiting outpost. 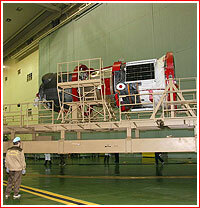 The Soyuz-FG rocket was scheduled to launch Soyuz TMA-04M (No. 704) from Baikonur to the International Space Station, ISS, at the end of March 2012. However on Jan. 27, 2012, a semi-official Interfax news agency reported that a breach of air-tight walls of the descent module for the Soyuz TMA-04M spacecraft had been discovered during testing of the vehicle in a vacuum chamber. The severity of the problem required to postpone the launch from March to the second half of April or the first half of May 2012, Interfax said. According to RIA Novosti news agency, the problem was discovered during a test on January 22. However, in an interview with Vesti TV channel the head of Roskosmos' manned space flight directorate Aleksei Krasnov downplayed the problem, saying that no decision on the delay had been made, while any required changes in the schedule would be absorbed by the redundancy in the (ISS) program. According to industry sources, a small breach in the descent module was discovered on January 23, during testing at a barometric chamber at the Check and Test Facility, KIS, of RKK Energia in Korolev. When specialists checked the interior of the descent module, they reportedly discovered that internal surfaces of the vehicle were distorted and bloated. Initial data showed that the descent module had been pressurized up to three or even four atmospheres, instead of nominal 1.3-1.5 atmospheres, even though test personnel claimed that they had followed all standard procedures during the test. Such tests normally include increase of internal pressure in stages. The bad quality of material of the spacecraft, which had been manufactured in the summer of 2011, had also been suspected, however its initial post-production pressure tests before the installation of the interior reportedly went flawlessly. Another report surfaced on January 29, 2012, said that a welding line on the descent module had broken as a result of the internal pressure, which exceeded allowable parameters for such tests. Structural stringers were also damaged, according to other reports. According to one posting on the web forum of the Novosti Kosmonavtiki magazine by a specialist at Korolev, the descent module for the vehicle No. 704 was damaged beyond repair, although the habitation section and the instrument module had not been damaged. Another descent module for vehicle No. 705 was at KIS facility at the time of the accident, while a similar module for vehicle No. 706 was still in the process of assembly. If the decision was made to use the descent module No. 705 for the next Soyuz mission, 1.5 months would be required for its testing at KIS, followed by a transportation to Baikonur, where another 1.5 months would be needed to prepare the ship for launch. Therefore, the Soyuz TMA-04M mission could lift off no earlier than at the end of April 2012. On Jan. 30, 2012, the director of the Experimental Machine-building Plant, ZEM, which is RKK Energia's main manufacturing base, reportedly called for the shipment of the vehicle No. 704 with the new descent module to Baikonur by February 13, however, according to sources within the industry it would not be possible to meet such a deadline. On the same day, in an interview with the official ITAR-TASS news agency, the head of manned space flight directorate at Roskosmos Aleksei Krasnov did confirm that the next manned Soyuz launch would have to be postponed until middle of May, however the official approval of the upcoming ISS missions would take place on Feb. 2, 2012, after a teleconference with all space station project partners. Particularly, flight planners would like to ensure that the scheduled landing of the Soyuz TMA-22 spacecraft would take place in daylight, Krasnov said. 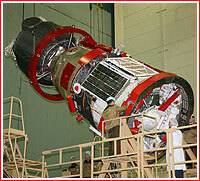 By February 1, the decision was made to use the entirely new Soyuz vehicle (No. 705 - next in the assembly pipeline) for the upcoming mission to the ISS. Plans to cannibalize the descent module from vehicle No. 705 and integrate it with a habitation module and an instrument section from the damaged vehicle No. 704 were dropped. These two undamaged components could still be reused for a future mission, sources said. In the meantime, two specialists involved in the botched pressure test on Soyuz reportedly died in the aftermath of the accident, likely from stress-related trauma. One independent source reported that an official responsible for the vacuum chamber, where the botched test had taken place, had been asked by the management to write a report on the accident. The official responded that he had had a day off at the time of the failure, however on the way back from work he had collapsed by the security gate to the RKK Energia campus and died instantly. He was 59. By February 22, the Soyuz vehicle No. 705 was ready for the shipment to the launch site. According to Roskosmos, its processing at Baikonur's Site 254 started on the morning of February 27 with the unloading from the railway transport. At the time, its launch was set for May 15, 2012. Following autonomous tests of onboard systems, the integrated testing of Soyuz TMA-04M started on March 28, Roskosmos announced. By April 3, the spacecraft was moved to an echoless chamber for radio systems compatibility tests, while at Site 112 technicians were preparing to start the assembly of the Soyuz-FG rocket for the mission. 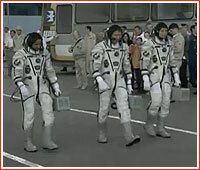 On May 2, 2012, primary and backup crews of Soyuz TMA-4 arrived to Baikonur for the familiarization training. Next day, they boarded their spacecraft for the first time at Site 254. On May 5, Soyuz TMA-4 loaded with propellant was returned from fueling station to the processing building at Site 254 for final integration. Following month-and-half delay by technical problems with their spacecraft, three new crew members are heading to the International Space Station, ISS, for the first time in 2012. 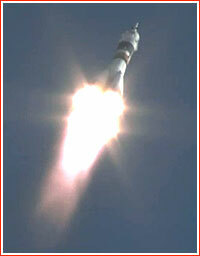 The Soyuz FG rocket carrying the Soyuz TMA-04M spacecraft blasted off from Pad No. 5 at Site 1 in Baikonur Cosmodrome on May 15, 2012, at 07:01:23 Moscow Time (03:01 GMT; 11:01 EST on Monday, May 14). Onboard were Russian cosmonauts Gennady Padalka (commander of the crew) and Sergei Revin (flight engineer); and a NASA astronaut Joe Acaba (flight engineer). 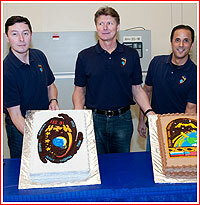 They represent the 31st and 32nd long-duration expedition onboard the ISS. Slightly more than 10 minutes after the liftoff, mission control confirmed that the Soyuz made it to orbit successfully. The docking of Soyuz TMA-04M with the station took place on May 17, 2012, at 08:35:56 Moscow Time (04:35 GMT). The spacecraft berthed at the MIM-2 Poisk module of the ISS. Hatches between Soyuz TMA-04M and the station were opened at 11:16 Moscow Time on the same day. The new crew was expected to spend 123 days onboard the outpost and return to Earth on Sept. 17, 2012. A Falcon-9 rocket carrying the Dragon spacecraft built by the US-based SpaceX company lifted off from Cape Canaveral, Florida, on May 21, 2012. 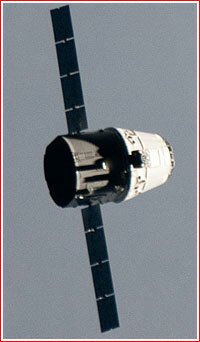 The Dragon successfully reached the station for the first time on May 25, opening a new supply line to the ISS. The spacecraft was securely bolted to the Harmony module of the International Space Station at 12:02 p.m. EDT. The hatch between the newly arrived Dragon spacecraft and the Harmony module was opened by NASA Astronaut Don Pettit on May 26, at 5:53 am EDT, as the station flew 253 miles above Auckland, New Zealand. The hatch opening began four days of operations to upload more than 1,000 pounds of cargo from the new vehicle. Wearing protective masks and goggles, as is customary for the opening of a hatch to any newly arrived vehicle at the station, Pettit entered the Dragon with Station Commander Oleg Kononenko. Three out of six members of the long-duration crew onboard the International Space Station returned to Earth during the night from Sunday to Monday after 125 days in space. The landing of the Soyuz TMA-04M spacecraft with Gennady Padalka, Sergei Revin and Joe Acaba onboard was scheduled for Monday Sept. 17, 2012, at 05:52:35 Moscow Decree Time, (10:52 p.m. EDT on Sunday, September 16). The landing was planned at the touchdown Site No. 1, some 86 kilometers northwest of Arkalyk, Kazakhstan, after a 125-day mission. NASA did confirm that the spacecraft had touched down exactly on time and where expected, but tipped over on its side after the landing. A trio of An-12 and An-26 planes and 12 Mi-8 helicopters were to support the landing from the air, along with six all-terrain recovery vehicles and around a dozen of support vehicles on the ground. Original plans called for the landing at Site No. 6 during the first orbit on September 17. 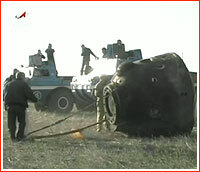 However in August, technical problems disrupted plans to maneuver the ISS into its planned orbit for the Soyuz landing. As a result, the ascent node (the point where the orbiting vehicle crosses the Equator on the way from southern to northern hemisphere) for Soyuz TMA-04M's final orbit shifted along the Earth's longitude. In turn, it pushed the touchdown point to landing Site No. 5, which was unacceptable for search and rescue teams (possibly due to lighting conditions in the area very early in the morning). To resolve the issue, the mission managers delayed the landing to the second orbit, which placed the landing point at Site No. 1. According to NASA, the closing of hatches between the International Space Station and the transport spacecraft was scheduled at 3:30 p.m. EDT on September 16. Mission control in Korolev confirmed that Soyuz TMA-04M undocked from the station as scheduled at 7:09 p.m. (03:09:00 Moscow Time on September 17). Its deorbiting deorbiting maneuver was to begin at 9:56 p.m.